"The most fantastic, EASY candy you can make... sinfully delicious and habit forming. I have only seen this fail once, and then the disaster was the most marvelous gooey pecan praline ice cream topping." In a deep, microwave-safe bowl, mix together brown sugar, whipping cream, and corn syrup. Microwave on High for 13 minutes. Mix in butter until well blended. Then stir, stir, and stir until mixture begins to cool and get creamy. Stir in chopped nuts. Drop by tablespoonfuls onto waxed paper to cool. See how to make crunchy peanut brittle the super-quick way. not very good.......i think maybe i did something wrong because everyone else that reviewed liked them. They were too soft maybe?? 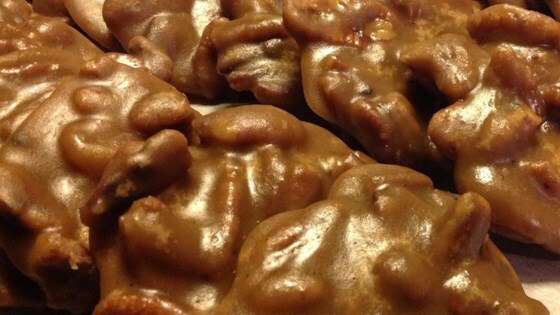 yep, this isn't your mother's pralines! Fast, delicious...and you'll definitely know if you have any cavities after one bite!